In an age where heavy metal music cruises with high-profile line-ups are becoming a dime a dozen, it’s about time that true guitar pros, gearheads, theorists and hobbyists have a voyage of their own. Imagine a cruise exclusively planned for guitarists and instrumentalists, featuring performances and personal lessons from some of the greatest guitar gods on the planet. Wake up – you are not dreaming! 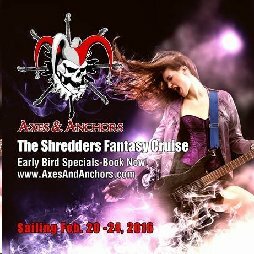 Prepare to learn from the masters on what fans have dubbed the “shredders cruise”: the 5-day/4-night AXES & ANCHORS cruise aboard the Carnival Victory, departing from Miami, FL on February 20, stopping in Key West, FL and Nassau, Bahamas, and docking back in Miami on February 24. Witness blazing performances and take lessons directly from world-class rock and metal guitarists includingZAKK WYLDE (Ozzy Osbourne, Black Label Society), YNGWIE MALMSTEEN, MICHAEL SCHENKER (Scorpions, UFO, MSG), ALEX SKOLNICK (Testament, Trans-Siberian Orchestra),TRACII GUNS (Guns N’ Roses, LA Guns), DARIO LORINA (Black Label Society, Lizzy Borden), and more, all while sailing the high seas and visiting exotic locales.